Emmequattro drive gearboxes are suitable for self-propelled machines with combustion engine, hydromotor or electric motor. 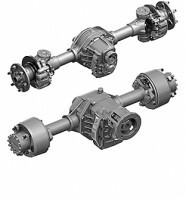 The range of products, recently expanded with new products, includes rigid and steering differential drive axles (also with hypoid bevel gears), integrated differential gearboxes, fitted for hydraulic and electric motors, differentials with epicycloidal gear reduction and multiple oil-bath brake disks, 1- or 2-speed transfer reduction units. Our products can equip trucks as well as light commercial vehicles (2 or 4 wheel drive), special vehicles used in city maintenance (street sweepers, municipal waste collectors), minibus or GSE Ground Support Equipment (passengers conveyors belts, conveyors and tow tractors) and, more generally, self-propelled farming machines (fruit harvesters and crop sprayers) and building industry machines (dumpers, concrete mixers, mini-shovels). 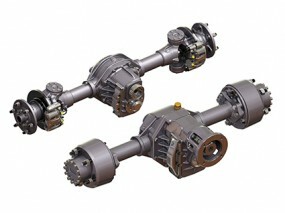 A wide range of electric motors is available to drive the axle.